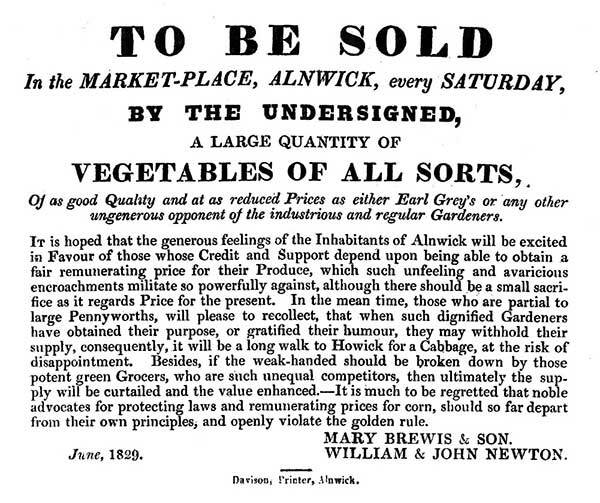 It seems that the difficulty of retaining a good fruit and veg merchant in Alnwick marketplace is not as recent as we thought. Problems seem to go back almost 200 years from the evidence of this poster. One can only assume that Earl Grey-whose enormous estate would have employed many gardeners- thought that selling off surplus produce to the poor was a good thing. The phrase “It will be a long walk to Howick for a cabbage” is especially potent..
(This sample from the prodigious output of William Davison is to be found amongst many other fascinating old posters, artworks and photographs on our new second musem site bailiffgatecollections.co.uk).